I have really enjoyed this series. I am always amazed at how Ms. Alsop can craft a story that has me hooked within the first few pages. 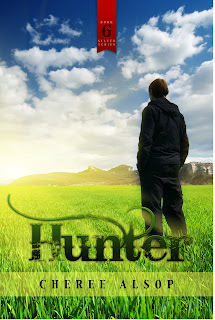 I was so thrilled to read Hunter. As we get to see how things go for Gem from Azure. I am truly empowered when I read about Gem and her outlook on life is so different than I would have pictured. Now Dray is isolated until he meets the new girl in school, Gem! Dray is always looking out for others and that is something you don't come across very often. Dray is so likeable and just a good old farm boy! One of my favorite scenes is the bailing hay with the tractor. It was sweet and fun! I will tell you all that I was impressed with the ending and how Dray put himself out to protect those he loves. Which changes his life forever! Ms. Alsop does an amazing job with character development and keeping up with past characters! I was surprised many times when I thought things were going to turn out one way and then I got thrown for a loop and things went a totally different direction. I simply could not get enough of this book! I do look forward to seeing Mouse get his story. I know I will not be disappointed. This story is not to be missed it is jam packed with first love, adventure, some thrilling fight scenes and much much more. I truly hope you enjoy this read as much as I did! Just FYI~ this does contain some violence.